Secondary Inscription: Inscribed "Dedie et presenté a S.A.S. MADAME LA DUCHESSE DU MAINE par [son] tres humble et trés obéissant [serviteur] Nollet.Lic. en Theologie. , Borde exc." 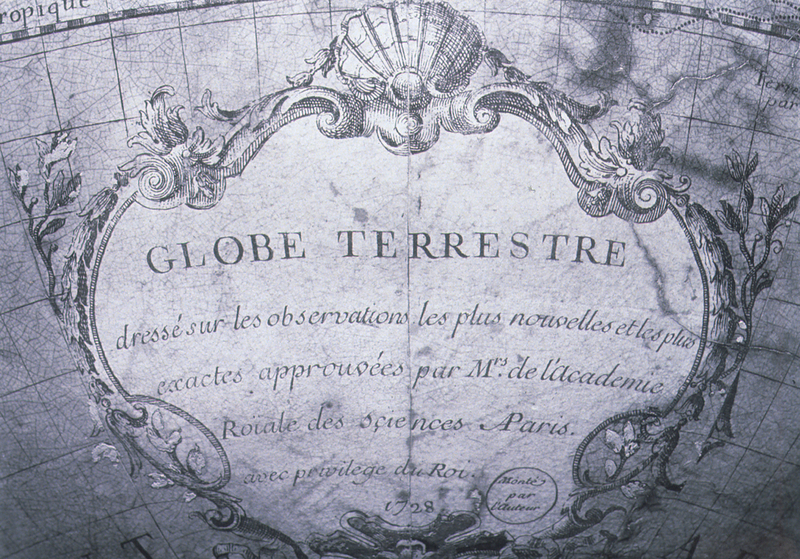 and "GLOBE TERRESTRE DRESSÉ sur les observations les plus nouvelles et le plus exactes approuvées par Mrs. de l'Academie Roïale des sciences [AP]aris avec privilege du Roi. 1728 Monté par l'auteur". Stand painted underneath in yellow "N. 32" and in blue, perhaps stenciled, (?) "3323". 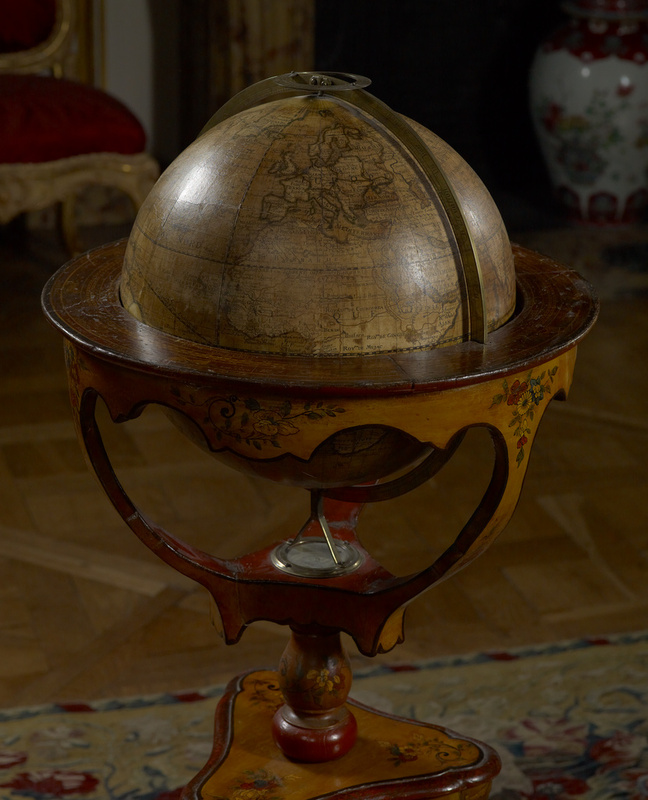 Jean-François Nollet, a noted scientist who taught physics to the French royal children, designed and assembled this globe, which shows a map of the earth's surface. In 1728 he dedicated it to the duchesse du Maine, the wife of Louis XIV's eldest illegitimate child. 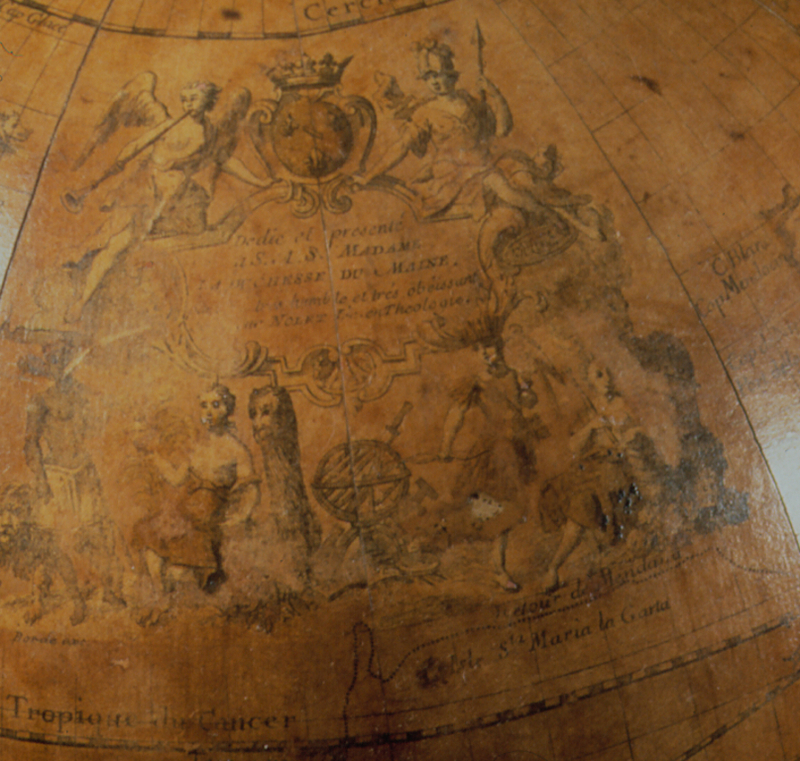 The duchesse was Nollet's most important patron and aunt to the comte de Clermont, to whom the celestial globe is dedicated. Louis Borde, the engraver of the map, also sponsored the costly printing process. He was the publisher who provided the money needed for the engraving of the copper plate, supervised the different stages of printing and the distribution of the prints, and remained in principle the owner of the plate. Guillaume de Gontaut-Biron, twelfth marquis de Biron, French, 1859 - 1939 (Paris, France), by inheritance to his nephew, Hélie de Talleyrand- Périgord, 1939. Source: Maurice Segoura invoice, September 22, 1986, in the files of the J. Paul Getty Museum, Department of Sculpture and Decorative Arts. Hélie de Talleyrand- Périgord, duke of Talleyrand, seventh duke of Dino, Italian, 1882 - 1968 (Château de Saint-Brice-sous-Forêt, Pavillon Colombe, Val d'Oise, France), by inheritance to his nephew, Manuel Gonzalez de Andia y Talleyrand-Périgord, 1968. Source: Maurice Segoura invoice, September 22, 1986, in the files of the J. Paul Getty Museum, Department of Sculpture and Decorative Arts; E.S. "Un grand collectionneur ressuscite une 'folie' du dix-huitième siècle." Connaissance des Arts 70 (December 1957). Maurice Segoura Gallery (Paris, France), sold to the J. Paul Getty Museum, 1986. E.S. "Un grand collectionneur ressuscite une 'folie' du dix-huitième siècle." Connaissance des Arts 70 (December 1957), p. 110, ill.
Fregnac, Claude. Merveilles des châteaux de l'Ile de France (Paris: Hachette, 1963), p. 150, ill. "Acquisitions/1986." The J. Paul Getty Museum Journal 15 (1987), p. 221, no. 101. Augarde, Jean-Dominique. "La Fabrication des instruments scientifiques du XVIIIe siècle et la corporation des fondeurs." In Studies in the History of Scientific Instruments. Christine Blondel, et al., ed. (London: Rogers Turner Books, 1989), p. 57. Ronfort, Jean-Nérée. 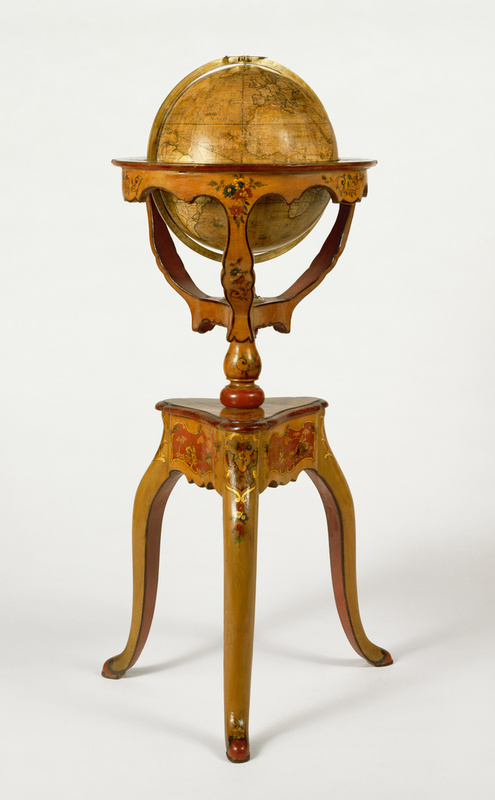 "Science and Luxury: Two Acquisitions by the J. Paul Getty Museum." The J. Paul Getty Museum Journal 17 (1989), pp. 51-66, fig. 13-17. Wilson, Gillian. "Dalla Raccolta del Museo J. Paul Getty, II Puntata." Casa Vogue Antiques 8 (May 1990), pp. 116, 119, ill. The J. Paul Getty Museum Handbook of the Collections. 3rd ed. (Malibu: J. Paul Getty Museum, 1991), p. 167. Bremer-David, Charissa, et al. Decorative Arts: An Illustrated Summary Catalogue of the Collections of the J. Paul Getty Museum (Malibu: J. Paul Getty Museum, 1993), p. 93, no. 146. The J. Paul Getty Museum Handbook of the Collections. 4th ed. (Los Angeles: J. Paul Getty Museum, 1997), p. 197. Masterpieces of the J. Paul Getty Museum: Decorative Arts (Los Angeles: J. Paul Getty Museum, 1997), p. 73, no. 54. Miller, Susan. "Images of Asia in French Luxury Goods: Jean-Antoine Fraisse at Chantilly, c. 1729-36." Apollo 154, no. 477 (November 2001), pp. 7-8, figs. 13-14. Wilson, Gillian, and Catherine Hess. Summary Catalogue of European Decorative Arts in the J. Paul Getty Museum (Los Angeles: J. Paul Getty Museum, 2001), p. 75, no. 146. The J. Paul Getty Museum Handbook of the Collections. 6th ed. (Los Angeles: J. Paul Getty Museum, 2001), p. 197. Pyenson, Lewis and Jean-François Gauvin eds. The Art of Teaching Physics: The Eighteenth-Century Demonstration Apparatus of Jean Antoine Nollet (Sillery, Québec: Septentrion, 2002), pp. 188-189, ill. The J. Paul Getty Museum Handbook of the Collections. 7th ed. (Los Angeles: J. Paul Getty Museum, 2007), p. 225, ill.
Bremer-David, Charissa, ed. Paris: Life & Luxury in the Eighteenth Century, exh. cat. (Los Angeles: The J. Paul Getty Museum, 2011), p. 120, no. 26. The J. Paul Getty Museum Handbook of the Collections. 8th ed. (Los Angeles: J. Paul Getty Museum, 2015), p. 270, ill.